North of Bourgas lies the ancient town and popular Bulgarian holiday destination of Nessebar, located on the tip of a long and narrow peninsula in the Black Sea. The picturesque town is one of the oldest in Europe, emerging as a fortified Thracian settlement over 9,000 years ago and changing hands many times before being captured by the Bulgarians in the 7th century. Like many European cities, Nessebar has an old town and a new town, but it is the old quarter that gives the peninsula its character, and is protected as a UNESCO World Heritage site. A popular tourist attraction, Nessebar charms holidaymakers with its narrow cobblestone streets, period wooden houses, courtyards, taverns and romantic atmosphere. The old town is famous for its medieval churches, with beautiful facades and well-preserved interiors that are remnants of the historic Slav and Greek Orthodox communities. Nessebar is an architectural and historic monument of Bulgarian culture and is one of the most popular tourist resorts along the southern coast. It offers a good selection of private accommodation, and the new town has modern facilities as well as larger hotels. 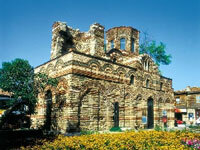 Popular souvenirs from Nessebar include leather and textiles, wooden toys, and silver jewellery. The street markets in Nessebar's old quarter have a good variety of colourful mementos. Nessebar has no shortage of restaurants, cafés and taverns for visitors to choose from on holiday. The most alluring restaurants are along Roussalka and Tsar Ivan Assen Streets on the southeastern tip of the peninsula. Fresh seafood and sea views are the order of the day! Nessebar's nightlife is limited, but the mega-resort of Sunny Beach is just two miles (3km) away and offers an excellent nightlife for those seeking more entertainment than the quiet beach holiday can offer. Nessebar has two beaches near the new town as well as the nearby beaches of the Sunny Beach resort, which also offers all the activities of a large-scale tourist resort. The old town is full of architectural monuments, ancient churches and museums to explore. For modern amenities and a bigger variety of holiday accommodation it is necessary to stay in the new town on the mainland, which doesn't have the charm and atmosphere of the old quarter.